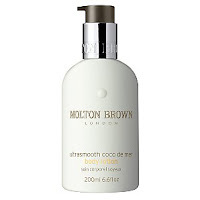 If you feel like your legs aren`t as smooth as they used to be, there`s one best kept secret: Molton Brown`s Ultrasmooth Coco de Mer body lotion. It`s a deep hydrating, ultra-light formula that`s really melting into your skin, leaving it unbelievably soft and smooth. It also has got a great scent and I`m sure you`ll adore the blend of Coco de mer with honey.